One of the groups I'm on recently had a Slit Flower Frame Challenge, this is the card my partner Joan Bowden made using The Snowflake Spot and It's Snow Time. 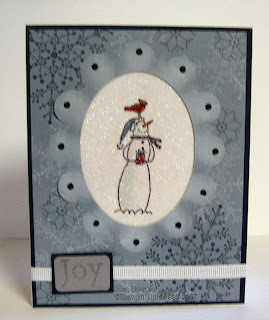 That is an adorable snowman Christmas card. i love the background with the snowflakes, you it must dazzle IRL. How much fun was it getting a Christmas card in June!